I was feeling all warm and fuzzy about having gotten so many interviews on this year’s Low Carb Cruise, when Mrs. N=1 asked me if I had done any posts on the various presentations. I guess I’ll have to do that later. I do have some brief notes that I took, so I should be able to do a summary of the sessions after I get through with the videos. 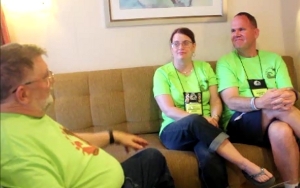 First up for this year’s Low-Carb Cruise interviews is Christine and Jimmy Moore. Mrs. N=1 and I had the great good fortune to draw seats at the same table with Christine and Jimmy for dinner, so I had the opportunity to talk them into coming up to my cabin on the first night. I wanted to get to them first, since I knew that Jimmy had a killer schedule with running the seminars and finishing up his new book, and would probably be impossible to get to later. So, still in our first-day green LCC T-shirts, we gathered in our cabin immediately after dinner, with Mrs. N=1 managing the camera. This time, I did a sound check so that we could do the whole thing in one sitting! Despite my efforts to keep it under 30 minutes, Christine and Jimmy were so engaging that I lost track of the time, and went a bit over. Jimmy gave me a scoop on his next big project, which you will learn about in the video below. Enjoy! 18:30 Jimmy and Christine get locked out of their cabin. 18:40 Scoop on Jimmy’s next big project! This entry was posted in Diet, Health, Low Carb Cruising!, Low Carb Fun, Paleo. Bookmark the permalink.